Palm coatings are an incredible addition to your work gloves. But choosing the correct glove coating for your job can be tricky. Take the photo below for example, three nearly identical palm coatings are laid side-by-side but only one will give you good grip in wet conditions. 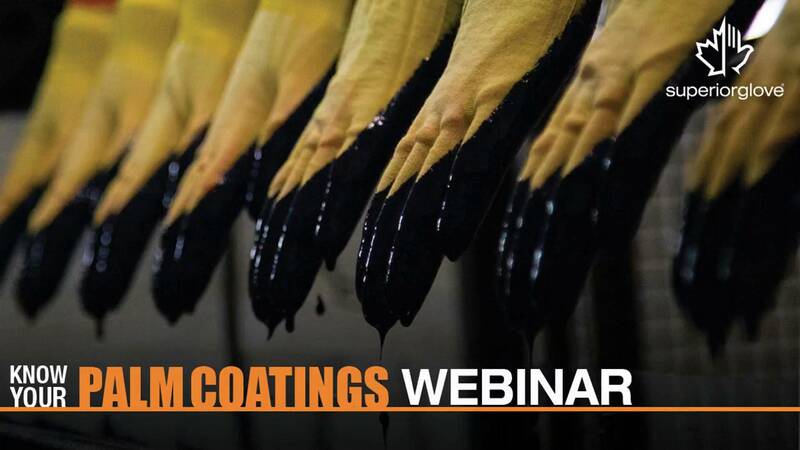 We created this free webinar “Know Your Palm Coatings” to preach the good word of glove coatings and when you should choose each type. Palm-coated work gloves are suited for handling small parts, the automotive industry, metal stamping, construction and general purpose, by offering better grip, dexterity, increased abrasion resistance, puncture resistance and durability. Watch the On-Demand Version of Know Your Palm Coatings Here! What should I look for in palm-coated work gloves? Nitrile is becoming the coating of choice for most jobs because it protects from many hazards. Nitrile-coated gloves offer excellent puncture and tear resistance. The main difference between latex and nitrile when it comes to chemical resistance is that nitrile stands up well to oil, making it a good choice for metal stamping or handling small oily parts. Nitrile performs well in a range of temperatures between -4°C (25°F) and 149°C (300°F). Flat nitrile is a good general purpose palm coating in the construction or warehousing industries. The compounds that make up nitrile can also be manipulated to create foam nitrile or micropore nitrile. Foam nitrile is a ‘whipped’ version of the flat nitrile coating. Foam nitrile acts like a sponge to absorb liquids. This gives you better grip than a flat nitrile coating. Foam nitrile palm-coated work gloves will be good in construction and fabrication jobs with light oil like our S13CXGRFN. Micropore nitrile is another variety of flat nitrile. It is specially treated to create tiny craters on the surface of the coating. The benefit here is that unlike foam nitrile, micropore nitrile doesn’t absorb oils and liquids so your hands stay dry. The craters act like tiny suction cups to improve your grip in wet and oily conditions. Micropore nitrile is perfect for industries like metal fabrication or automotive assembly like on our STAGHVPN pictured below. With its great stretch, strength, and low particulate shed, polyurethane polyurethane might be the most underrated palm coating for work gloves. Polyurethane has been around for roughly seventy years, appreciation for its non-allergenic properties for use in medical equipment has grown only recently. Polyurethane’s main strength is that it’s ‘grippy’ without being sticky. If there’s anyone on your team who complains that they can’t feel while wearing gloves, this palm coating might be the answer. Can’t Decide Between Polyurethane and Micropore Nitrile? Polyurethane’s softness, combined with moderate puncture and abrasion resistance, make it a most versatile polymer. It is a very desirable coating for cut-resistant gloves, because it provides grip and boosts puncture resistance, without adding bulk. The low-particulate shed mentioned earlier makes polyurethane a perfect choice for those working with electronics and in cleanrooms. Chemically, polyurethane has excellent resistance to oils, solvents, fats, greases, gasoline, oxidation and ozone but has poor resistance to hot water and is not recommended for use above 79°C (175°F). Polyurethane is also not advisable for grip in wet conditions. In fabrication or assembly jobs, polyurethane palm-coated work gloves like the STACXPURT pictured below are a perfect option. This purely synthetic material is inexpensive, does not cause allergic reaction and stronger that latex or nitrile. As a palm coating, PVC offers good abrasion resistance, though it may be susceptible to punctures and snags. While it is flexible, it does not provide the tactile sensitivity associated with most rubber products. It’s ideal for woodworking, automotive assembly, trim applications and any job where you’re at risk of getting sticky fingers. Latex has very high elasticity and outstanding grip compared to other glove materials. It can also withstand extreme temperature and tear resistance. Chemically it resists alcohols, and some ketones, but performs poorly around most hydrocarbon and organic solvents (i.e. gasoline). Latex has dropped in popularity over the last century because of skin allergy issues and the availability of alternatives like nitrile. In industries like glass manufacturing or construction, latex palm-coated work gloves like our S10KLX pictured below are cost-effective option. Neoprene is excellent in dry and wet grip, has great flame-resistant properties and good resistance to oil. It was invented by DuPont™ scientists in 1930 and is used in a variety of applications from car fan belts to dry suits for divers. Since it doesn’t drip or melt when exposed to heat and flame, neoprene is most often found on heat-resistant gloves and arc flash gloves. Traditionally arc flash gloves were made from leather but as technology advances more options were knitted from yarn and coated with neoprene, like our S18KGDNE. If none of this makes sense, check out our webinar The No-BS Approach to Arc Flash.